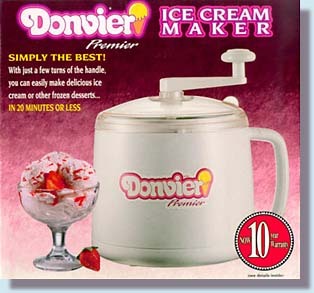 My friend Janelle is currently letting me borrow her old school Donvier hand crank ice cream maker and let's just say that The Don and I are certainly taking advantage of having it around. We decided to start with coconut milk ice cream rather than your traditional variety. It turned out so well that we haven't strayed from using coconut milk yet. The picture above is our favorite concoction so far; Nutella Chocolate Chunk. In a large bowl empty the can of coconut milk and add in the sugar and vanilla extract. Once these are mixed add the softened Nutella and chocolate pieces. Swirl the Nutella and chocolate in with a few swipes of a spatula (don't mix too much or the Nutella will blend in completely). 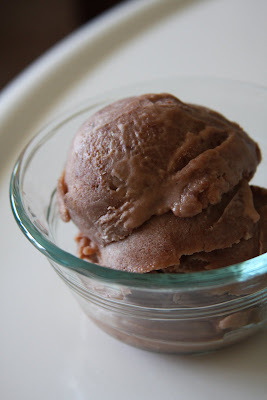 Let sit for a moment if you heated up the Nutella so that the warmth doesn't hinder the ice cream maker's ability to freeze the ingredients. Add the mixture to the ice cream maker and stir according to your ice cream maker's directions.